The ability to vote is taken for granted by many in the United States. It seems as though voting is something that occurs often and without fail sparks conversation, but for some, this is not necessarily the case. The first state to implement a law revoking the voting rights of felons was Kentucky in 1792. Over the next 60 years, many states joined the decision, making it common law. Although common law, states do all tend to have different takes on the idea and when, or if, felons should receive restoration for their right to vote upon release. Florida passed a law during the midterm elections which allows felons the right to vote once they have completed their time, including parole or probation, with automatic restoration. Prior to the change, Florida was one of few states which had a law that took away voting rights indefinitely for all felons within the state. Although a major topic of conversation, Florida is not the first to pass this law and make this decision for felons. According to the National Conference of State Legislatures, felons in 14 states and the District of Columbia will lose their voting rights while incarcerated and then receive restoration upon release. In 21 states, felons only lose their rights to vote during incarceration and for a period of time after, usually while on parole or probation. Felons will lose their voting rights indefinitely in 12 states. “It means that people convicted of a felony retain the right to participate in civic life once their debt to society has been deemed paid,” said Dr. Brie Diamond, an assistant professor of criminal justice at TCU. Diamond said that she expects more states to ease up on their disenfranchisement laws in the future as it seems felons cannot seem to ever get rid of this punishment. While Florida is not the first state to pass a law allowing felons who have served the entirety of their punishment to vote, Florida’s decision does come with consequences. Florida’s decision now allows more than one million felons to legally vote, a change that could swing the election in the future, according to CNBC. 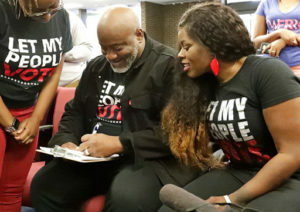 “This amendment will restore approximately 1.4 million voters rights (all except convicted murderers and felony sexual offenses),” said Dr. Kendra Bowen, an assistant professor of criminal justice at TCU. Florida has a population of 20,612,439 and a felon population of 1,686,318. According to the Washington Post, nearly 8 million people voted in the 2018 midterm election, meaning an additional 1,686,318 could have made an impact on the results if felons had the privilege to vote under this new law. The question that arises is whether or not this is a turning point within the U.S. government to allow all felons to vote within all 50 states. On the contrary, in a letter to the editor of the New York Times, Roger Clegg, president and general counsel for the Center for Equal Opportunity, wrote about why felons should not have the right to vote. “…the fundamental reason we do not let felons vote is that we have certain minimum, objective standards of responsibility, trustworthiness and loyalty to our laws that must be met before someone can participate in the sacred enterprise of self-government,” said Clegg. Florida is now one of 21 states where felons receive their right to vote after completing all sentencing, including parole or probation, making felons a key audience for elections in the future.